KEEP CALM AND CARRY ON: OUR KITCHEN: BEFORE AND AFTER! 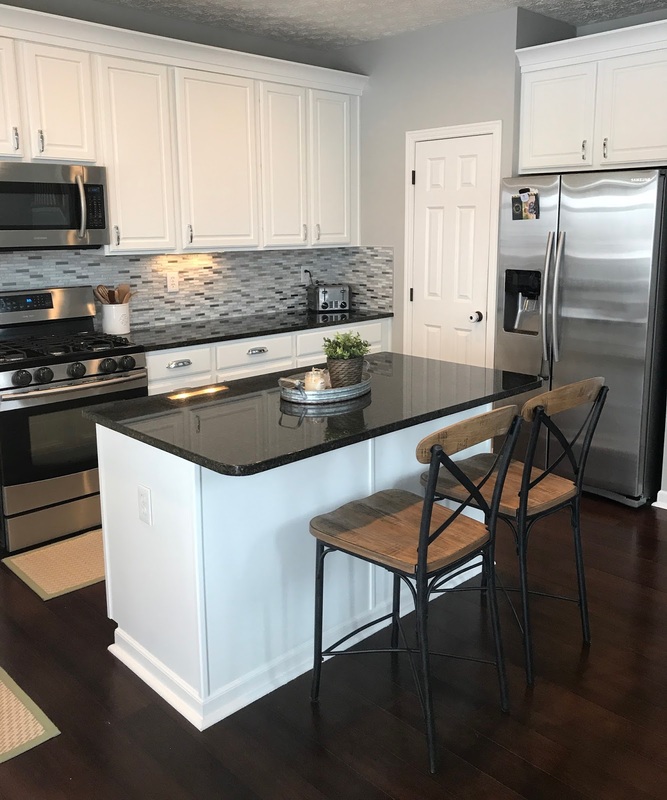 OUR KITCHEN: BEFORE AND AFTER! I'm so excited to finally share pictures of our kitchen! I was going to share pictures of our new kitchen table and chairs that is directly in front of this space, but the chairs weren't delivered this weekend like expected so I'll post those once I get them. 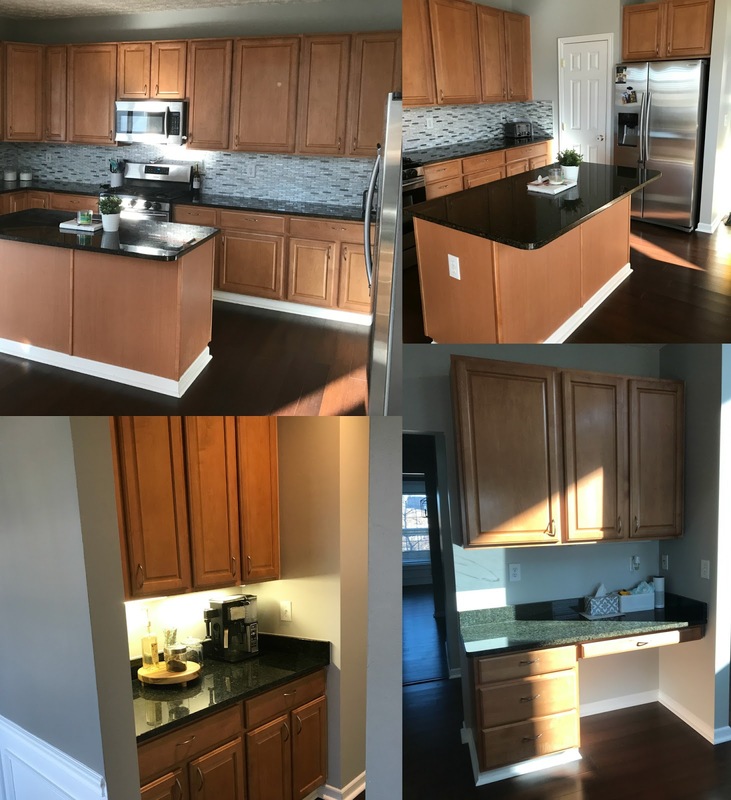 This is the second time we've had cabinets re-done in a house, but this time we decided to hire help vs. doing them ourselves like in our last home. The entire process from start to finish took them 4 days (after that we let them cure for about 3-4 more days before hanging back up), and we couldn't be happier with the results! It was worth every penny and we saved a lot by going this route vs. having them replaced. Our house is an open concept so changing the cabinets to white really brightened up our lower level even more and just changed so much! We absolutely love it. 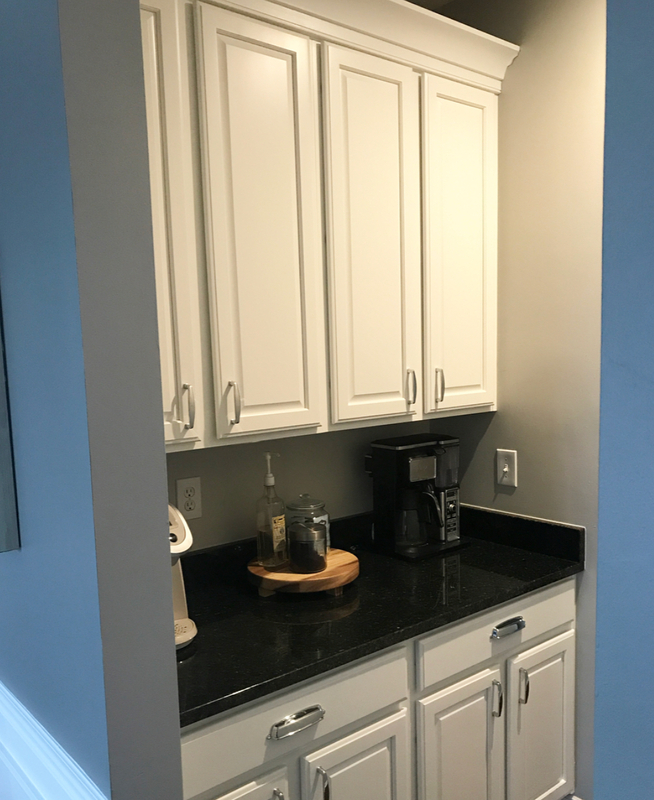 We also had crown molding installed above the cabinets, added a chrome sconce (highly recommend this website for buying lights!) over the sink, and bought new hardware (I bought black at first and kept them on for about 2 weeks but I just didn't end up loving the look and felt like I may get tired of it-I think just because our counters are also black and most of our light fixtures so I wanted something else.) Down the road we may change the back splash but we aren't in a rush to get that done right now. 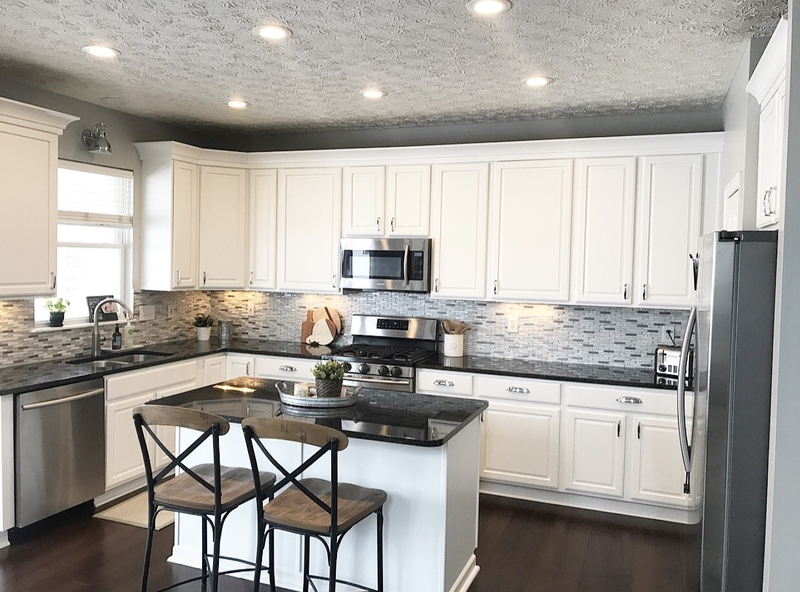 If anyone is wondering about specifics: they sprayed the cabinets with Benjamin Moore's Advance Paint in the color Simply White. The primer they used on them is STIX. Our counter stools are from Macy's, but currently sold out! I will update this if they come back in stock. Also, if you're local and want to know who we used for our cabinets and for the crown molding (and other trim work in our house) leave me a comment or email me and I can give you their info!! It looks awesome! So they actually took the cabinets out to paint them? That seems like a huge undertaking! We've been contemplating painting ours, but just haven't pulled the trigger yet. They sprayed the cabinets so yes they took them all off and did it in the back of our basement out of the way. It took four days from start to finish and was easy on our end since we didn’t do any of it :) It was so worth it!! Gorgeous! We painted our brown cabinets white as well and its like night and day. I love it. What a difference! Looks amazing!! Looks SO good! I would be so nervous with them pulling the cabinets down and putting them back up, but smart to leave to the professionals! Looks fantastic! It's so much brighter now, nothing beats timeless white cabinets. I'd love to know where you got the handles and pulls from for the drawers and cabinets!! Hi - I was wondering if you can share who you used to do the labor for the cabinet repainting? We are local and I want to be sure we find someone that does good work. Sure! Can you send me an email at whalenkat@gmail.com and I can send you their info? Thanks!